Just one of the many challenges of the Giant Angoras, is to get a great commercial body type underneath a wonderfully dense coat. 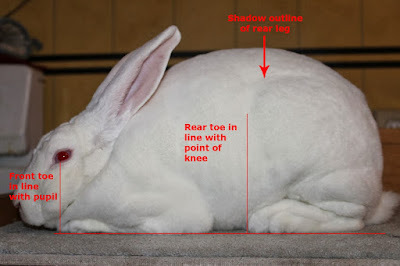 For fellow Giant Angora breeders, this starts with how to evaluate your Giants. If you are unsure on how a great commercial body type feels like, I would recommend attending a local rabbit show and seek out a New Zealand breeder. Ask them if they could let you have hands on one of their top rabbits. Hands on experience is great.